The two-time MLS Cup champion San Jose Earthquakes needed a world-class Android and iOS app in time for the opening of the stunning new Avaya Stadium, hailed by many as the best soccer facility in the U.S. 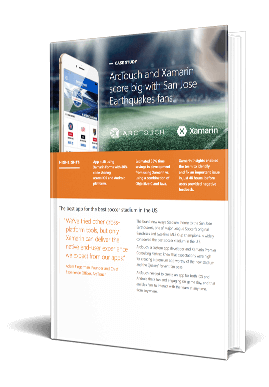 Learn how award-winning mobile app development studio ArcTouch used Xamarin tools, including Xamarin.Forms and Xamarin Insights, to efficiently deliver an app that really scored with Earthquakes fans. The Avaya Stadium app was built using Xamarin.Forms with 80% total code sharing across the iOS and Android platforms. ArcTouch estimates a 35% savings in development time from using Xamarin vs. using a combination of Objective-C and Java. Xamarin Insights enabled ArcTouch to identify and fix an important issue in just 48 hours, before users provided negative feedback.